The goal of this presentation is to try and break the perception of the EHR as a digital data vault, a system that you put data into, and retrieve data from. The EHR is a critical tool in the delivery of healthcare, and for this reason, it's more accurate to think of it as a conductor or quarterback, as the nervous system or road network. Not as a filing cabinet. Also, we must always view the purpose of the EHR system, its design and user interface, always in relationship to the goals and objectives of the healthcare system it is being deployed within. 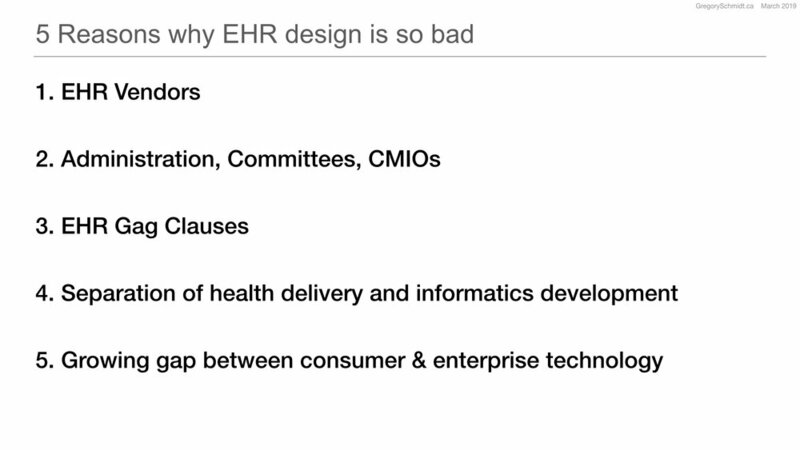 For this reason, EHR design is really always about healthcare system design. - Purpose of an EHR? - Why is EHR design so bad? First, we will clarify what is design, and underscore how design is how something works. Second, we will look at the disastrous state of design in contemporary EHRs. Review briefly some reasons on how got into this state, and some areas to consider for improvement as we design clinical systems today. Third, we will look to the future of electronic health record design. Specifically, the challenges and opportunities that healthcare presents from a global perspective, and the new unanswered EHR design questions these challenges leave us with. In the end, we will see, how the future of EHR design, is the future of medicine. Often we think of design as, how something looks. Someone may use the term esthetics as a synonym. 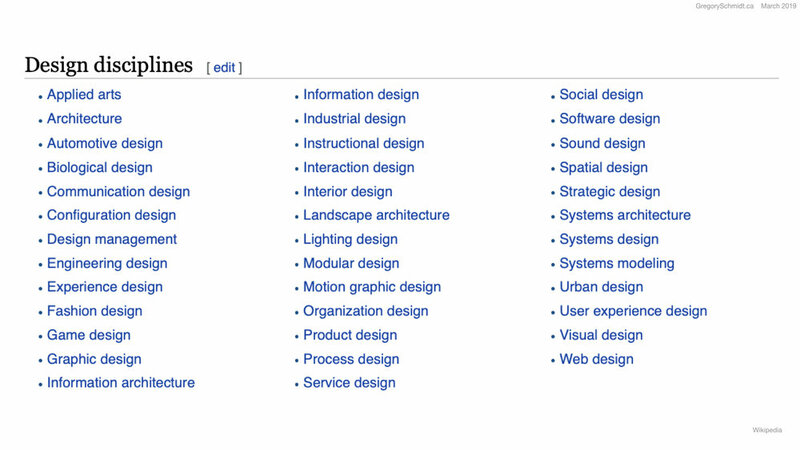 You can also look online (Wikipedia: Design) for many formal and complex definitions of design. Most people make the mistake of thinking design is what it looks like. People think it's this veneer – that the designers are handed this box and told, "Make it look good!" Design is how it works. This is the critical takeaway. Regardless of which discipline of design you are working in - often when we think of EHRs, we're thinking about user experience design, visual design, system design, process design, interaction design, etc, etc. But ultimately the big overarching question we are trying to ask ourselves is - how does it work? This means that a design is good or bad when the design is evaluated in relation to how well it solves a problem. If you were thinking about this from the perspective of philosophy we may say that something is good, insofar that it achieves its purpose. The purpose of a hammer is to hammer nails. The ability or inability of a hammer to hit nails provides a benchmark in our evaluation if it is a good or bad hammer. And so then the question is what is the purpose of the electronic healthcare record? What problem does its existence try to solve? By knowing the end problem we are solving for we can evaluate the design of an EHR, in its ability to achieve this goal. Consider the question yourself: what is the purpose of EHR? Or to even take a step back, what is the purpose of the medical record? The purpose of the medical record has grown over time. For many millennium, the medical record was held internally within the patient. Patients would verbally tell their clinician about their symptoms of scrofula or survey, or being treated with leeches. The first major milestone in medical records was the transition from oral history to written records. This occurred in the 1900s. Generally, it was brought about for the purpose of billing and having a record in case of litigation. We see the need for billing with the NHS in the 1940s. Billing and litigation, in many ways, nothing has changed. The second major milestone was the transition from unstructured notes to structured charts. As a patient’s care became more complex with more care providers, it was important that the medical record became a tool for communication within the medical team. The Problem Oriented Medical record of the 1970s exemplifies this shift to structured notation. The record could now also be used for auditing and quality assessments. The third major milestone was the transition of charts from paper to digital. A process that started in the 1970s and 1980s, but really gained traction in the 1990s through 2010s. EHR systems now are asked to help control costs, improve care, produce reports, administer population and public health, acts as a personal health record for patients to access, assist in drug & disease surveillance. The list goes on.. 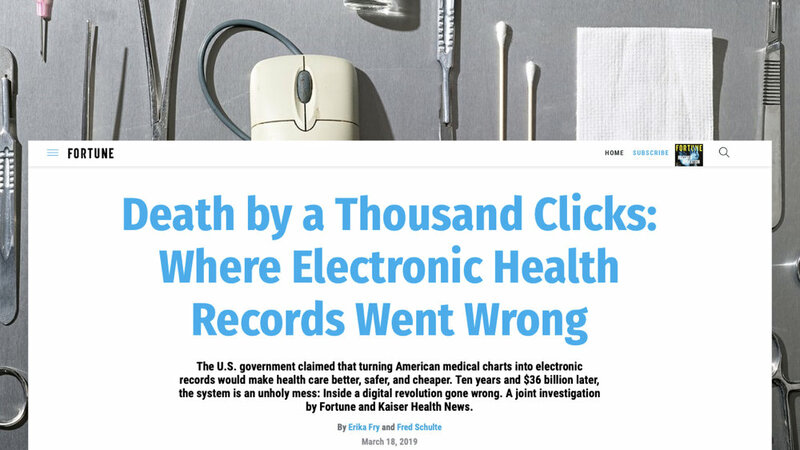 But the problem was when the medical record went from paper to digital, in many cases all that happened was a replication of the paper chart on a computer screen. It had the same tabs and dividers. In many respects the reason for this user interfaces was the general limitations of the user interface options available at the time. But little has changed over the last thirty years in terms of EHR user interface design and functionality, despite major changes in technology. The replication of the traditional paper record on a digital screen is results in an EHR that is ill-equipped to handle the demands of modern healthcare systems. The paper record structure was developed at a time when you had a single clinician or a small team of clinicians providing care. But today hundreds of people interact to provide care for a single patient. In the future as task shifting of work away from physicians into well trained allied health professionals increases even more people will need to coordinate their actions to deliver care. An information system designed to coordinate thousands of actors safely and in real time must be fundamentally thought of in a different manner than one where just a few actors are involved. EHR design is still stuck using a model of healthcare that is no longer applicable today, and certainly not prepared for tomorrow. To wrap up this section on design, we realize in order to understand what the purpose of the EHR is we must take a step back and ask, "What is the purpose of the healthcare system"? The purpose of this venture we call healthcare isn't to store data, nor create billings or reports. The purpose is to improve health. To keep the well healthy. To heal the sick. To comfort the dying. Therefore, the primary purpose of the medical record system is to improve health. Until EHR systems are able to do that they are only achieving secondary purposes. Billing, reporting, data storage, team communication, legal documentation - these are all secondary functions that help achieve the primary goal, but in of themselves are not the purpose of healthcare. We must always remain focused on the primary purpose of healthcare, and not let a secondary mean replace our primary purpose. So now that we have set a goal by which we can measure what an EHR system should do - let's move onto Part 2 and look at the state of design in EHRs today. 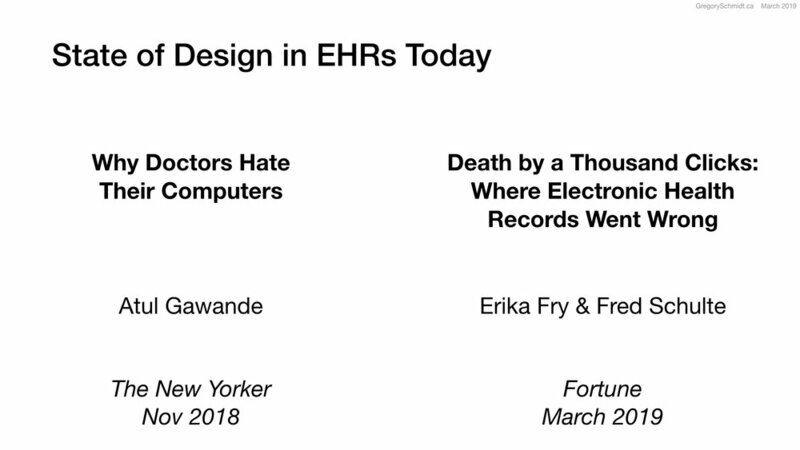 When we want to evaluate the state of design in EHRs today, we are really asking ourselves what is the impact of EHR systems on healthcare systems? For many years we have known that things are not going well. However, quite often these conversations were confined to the doctor's lounge, or medical conferences, where a favourite topic is the frustration of the information technology systems. Clinicians love to tell each other stories of how the user interface of EHR systems is slow to use, outdated, and reduces their ability to see patients. They voice how these systems user interfaces are dangerous and have caused patient errors. They complain how the cost to purchase EHR systems is sky high, and wonder if the funds could have achieved better returns in some other part of healthcare. Most frustrating, the one thing that people expect from digital systems, the ability to share information between doctors and with patients, remains fragmented and often impossible. These grievances are compounded by the fact physicians feel that nobody in their institution's administration understands their problems or wants to work with them to make the system better. 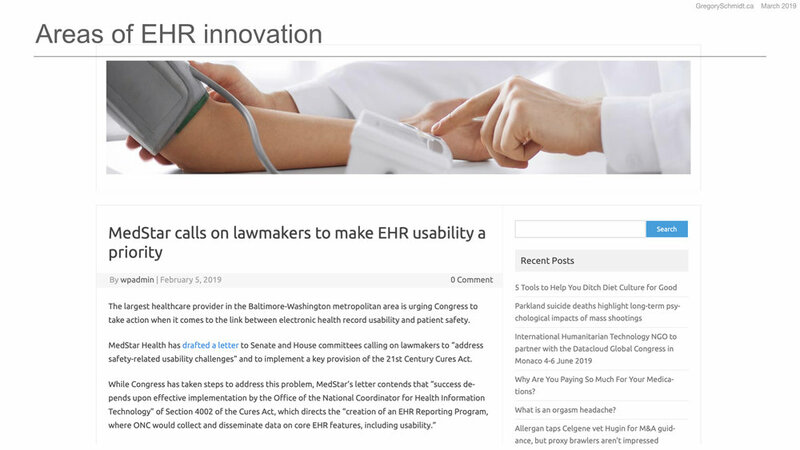 Numerous articles have been published discussing issues with the EHR. This one from 2013 discusses the number of clicks per a physician’s emergency department shift. Any process that involves 4000 clicks will be prone to error. The connection between physician burnout and EHRs has been known for a number of years too. 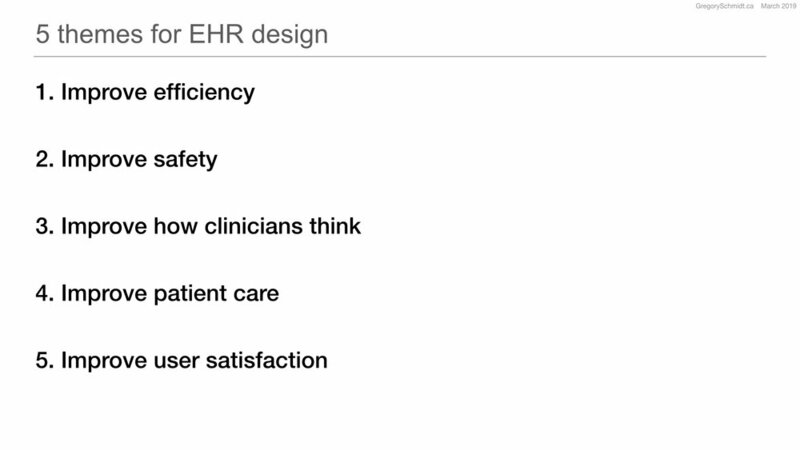 In multiple surveys, physicians rank the EHR, as their number one source of irritation in the workplace (2013 RAND). Several recent books have addressed the “Hope, Hype, and Harm at the Dawn of Medicine’s Computer Age”, such as Dr. Bob Watcher's The Digital Doctor (2015). Former head of Kaiser Permanente, Dr. Robert Pearl, discusses many of the shortcomings of EHR systems and the death of his father in the book, Mistreated: Why We Think We're Getting Good Health Care and Why We're Usually Wrong Hardcover (2017). Dissatisfaction with EHR systems is not limited to America, but is a global issue. A study of physicians in Finland, a country with wide EHR implementation, report low physician satisfaction (Usability problems do not heal by themselves: National survey on physicians’ experiences with EHRs in Finland). Another study evaluating primary care physicians in countries around the world came to similar conclusions about “concerns about the accessibility, reliability, and EMR utility” (Primary care physicians’ attitudes to the adoption of electronic medical records: a systematic review and evidence synthesis using the clinical adoption framework). To quantify physician’s opinions in the United States on their EHR systems, a widely circulated survey is Medscape’s EHR Report. Most recently published in 2016 it surveyed 15, 238 physicians in over 25 specialities. The Most Widely Used EHRs, remain Epic and Cerner. The Top Rated EHR is the Veteran Affairs (former) CPRS system. Yes, a home-grown government funded system is ranked by physicians as Top Rated. As Medscape observes - the top five EHRs were also all ranked higher in 2014 than they were in 2016. Reinforcing a trend we’ve seen elsewhere of lower satisfaction with EHR systems as time goes on. The Top Rated EHR by Those Who Ue Hospital Systems, was also VA-CPRS. And the Top Rated EHR for Independent Practice was Epic. The Top Rated EHR for Ease of Use & for Satisfaction was Amazing Charts & Practice Fusion sharing spots 1 and 2, with VA-CPRS in 3. 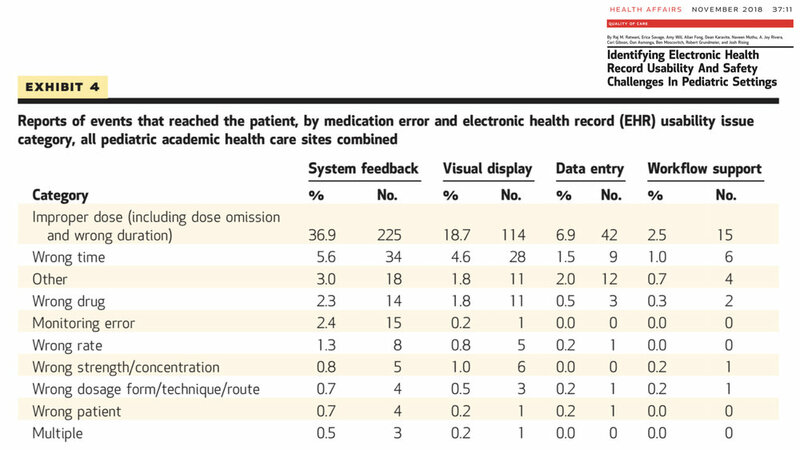 Top Rated EHR for Connectivity was VA-CPRS. Top Rated EHR for Usefulness as a Clinical Tool was VA-CPRS. A particularly interesting graph is the Effect of EHR on Your Practice. The categories of documentation, patient service, clinical operations, and bill collections are presented. The graph on the right, is the same data as is found on the left, but Dr Joel Selanikio reformatted that chart to merge the No change and Got Worse responses. We clearly see that the perception of an improved medical practice because of the EHR is a minority opinion. When the question of the EHR’s Effect on Patient Encounters, is asked, the response is even more stark. A positive response is the small minority opinion. Physicains report less face-to-face time with patients, no change or got worse in their ability to manage patient treatment plans, respond to patient issues, and the number of patients they can see. It is no surprise that Satisfaction With EHR Vendors is ranked overall neutral or negative. It is important to realize that comfort with EHRs, and disruption of workflows is generally persistent across all age groups of physicians. It is particularly concerning from a Design perspective of the “Tips” that physicians suggest on how to avoid a negative patient experience when using the EHR. These all appear significant workarounds, and not the experience that patients want when they go to the doctor. Despite all the above data - physicians will remain with their EHR. Again, I highly recommend you review all the slides from the original Medscape report here. Lets now look at some objective data that quantifies the above subjective experience of doctors. How many clicks and errors are in these systems? 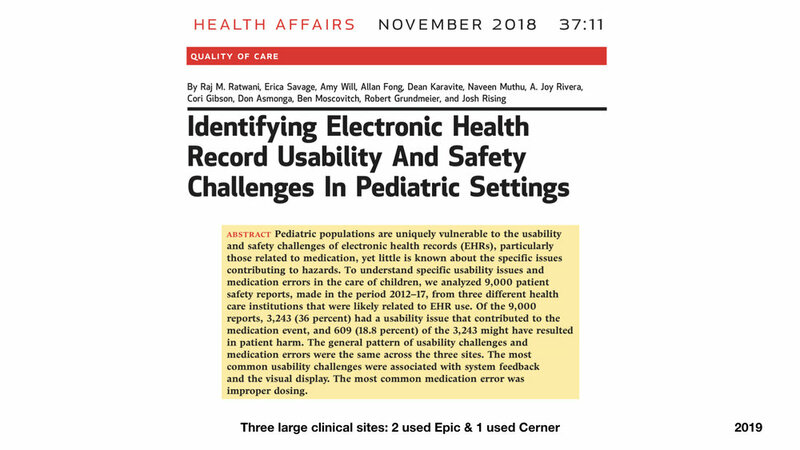 Two highlight two excellent 2018 publications on the efficiency of EHRs and dangers they pose we turn to the work of EHR usability expert Dr Raj Ratwani’s & his team. As an example, this study looks at two Epic and two Cerner implementations and found the time to enter this simple order - Tylenol (500mg PO, 4-6 hours - took about one minute, 14 to 62 mouse clicks, and resulted in an error 8%, 0%, 8% and 30% of the time. That error was a wrong dose, frequency, route or rate. 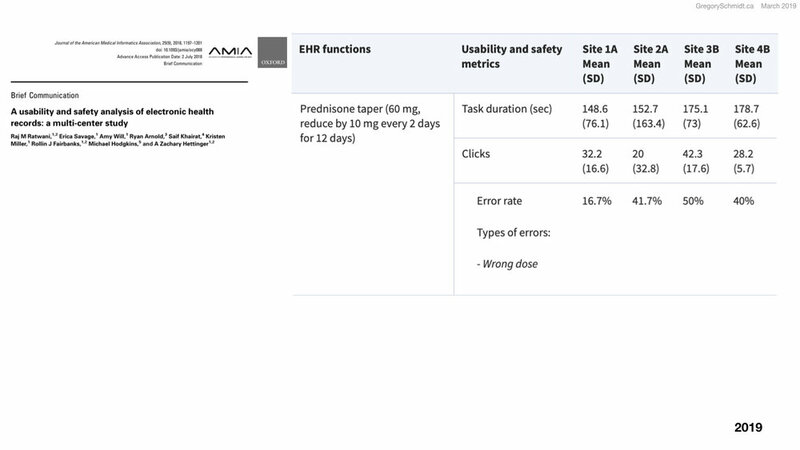 To enter this more complicated order - Prednisone taper 60mg, reduced by 10mg every 2 days for 12 days - took on average 3 minutes in the EHR, 20-42 clicks, and had wrong dose errors 17 to 50% of the time. Ordering of an x-ray took only 24 to 64 seconds, and 8 to 31 clicks, but resulted in an error 17 to 36% of the time. These are all routine orders, yet result in slow error prone processes. Imagine how long it takes to enter less typical orders and the errors associated with those. Another study led by Dr Ratwani looked at medication errors. They studies three major institutions using Epic and Cerner, and reviewed 9,000 patient safety reports between 2012 to 2017. 36% of the safety reports were attributed to usability issues, and it is thought that of those 19% of events may have resulted in harm. Medication errors were divided into the categories of System Feedback, Visual display, Data Entry, and Workflow Support. Exhibit 4 demonstrates the frequency of these error types: with in-proper dose and wrong time the most common occurrence. This GomerBlog study ranked the major EHRs by admin and clinicians. ZDoggMD - a former Stanford internist - routinely discusses the failings of modern EHR systems, and has almost a million views on this song about EHR systems. Despite articles, surveys, studies, and books it seemed relatively little has been done to address the mounting issues with EHR systems usability. But recently, this private frustration fo the medical community has begun to move from the physician lounge into the public conversation. Harvard labeled “physician burnout a public health crisis” in January 2019. And lay large part of the blame to “The growth in poorly designed digital health records and quality metrics has required that physicians spend more and more time on tasks that don’t directly benefit patients, contributing to a growing epidemic of physician burnout” [A Crisis in Healthcare: A Call to Action on Physician Burnout | Harvard Publication | January 2019 | Article Link]. In the last four months, two in-depth articles discussing the problem of information technology in healthcare have circulated widely the mainstream press. Each article is over 9000 words long. Highly recommended reading or listening. 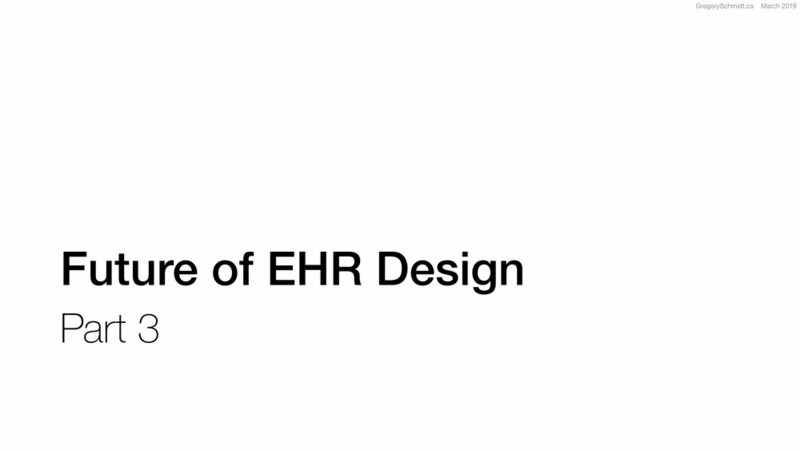 The titles themselves summarize the state of design in EHRs today. Atul's article accurately describes the frustration among physicians with the introduction of information technology into healthcare. 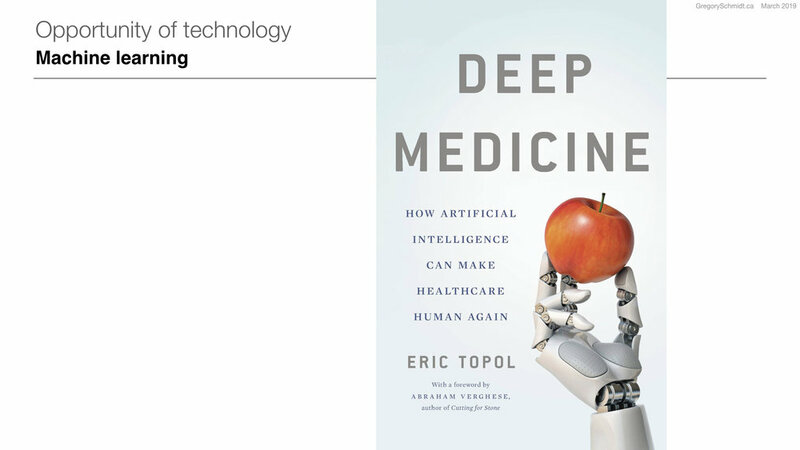 It highlights the tension created between physicians, patients, and machines. It accurately discusses the increased the burden of work health IT has placed upon clinicians. One problem with the article, is I believe it lumps very different causes of the information technology problem, into a generic category of ‘technology'. Atul sets up a dichotomy between technology and humanity, He doesn't separate out the issues with technology into the different groups responsible for it - such as the problems with health IT that are the result of objectively bad software, versus those problems created by administration and committees that poorly implement the software, versus Chief Medical Informatics Officers who campion the administration and not the clinical staff. Erika Fry and Fred Schulte add further backstory to the EHR problem by telling the story of how the 2008 recession caused the government to look for shovel ready projects with which to inject capital to stimulate the economy. The digitization of paper records in America was one of these shovel ready projects, and so over the course of the next decade over $36 billion dollars would be injected into the installation of health informatics systems. Prior to the government grants, people were not flocking to install EHR systems based on the incredible quality of these systems. However, with free money available, it dramatically grew in size an industry with a subpar product, without growing the quality of the product. Combined with meaningful use regulation, additional sloppy software design was rushed into the products to ship. I highly recommend both articles. Atul’s is available as audio, and the Fortune article has several short videos accompanying it. 2.2 Why is EHRs design so bad? The user interface design of most electronic healthcare records is objectively outdated. Most systems use a design language that appears to have been written in the 1990s, and not updated since. It is always ‘easier' to add more buttons, tabs, and separate windows to expand functionality. But this results in software that is a maze to navigate and is neither simple, intuitive, nor efficient. Why have the user interfaces of systems not been upgraded? It's complicated. Likely a combination of backend systems that were written decades ago, that make updating the frontend harder. I also believe that misaligned market competition plays a large role. EHR vendors compete on the size of market share for new sales, not directly on the quality of the product offering. Nobody got fired for buying IBM. Administrations saw the EHR as a means to capture increased billing in their healthcare system and as a result higher profits and returns. If this is the purpose of the healthcare system, and the EHR, it has achieved its goal. I also lump into this category Federal Administrators - who with good intentions created Meaningful Use regulations, that had unintended adverse consequences. Chief Medical Information Officers (CMIOs) don't get off the hook. Although some work hard on behalf of clinicians to improve the EHR, from my observations, in order to become a CMIO, one needs to drink the corporate EHR Kool-Aid. Often the CMIO is a champion of the administration and EHR vendor pushing physicians to use a system that is ‘good enough', rather than working with clinicians to demand of the administration and the EHR vendors that the systems are made better. A critical factor that has stifled the ability to share, learn, and push the EHR field forward is what is known as the EHR Gag Clause. 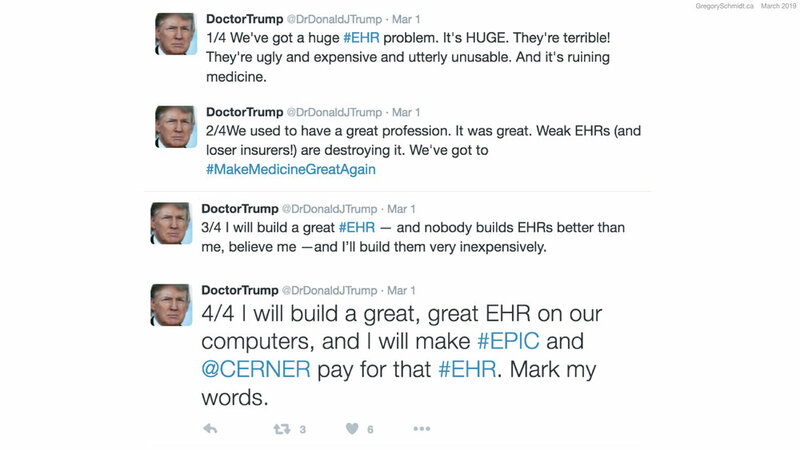 Many EHR contracts make it illegal for its users to speak poorly about the system, or to post screenshots - even for academic purposes. Explicit written permission from the vendor is required. This is why creating a presentation on EHR design is so difficult. Online there are not many screenshots of EHR user interfaces. I can't demonstrate how many clicks it takes on most systems to order a simple medication. Or how slow and fragmented the interface is to navigate and consume data. Or how the data density on screen is inappropriately low. EHR vendors have been known to threaten legal action against physicians who have tried to do this. Even when the physician has a safety concern. This is problematic for two reasons innovation and safety. Innovation: everyone becomes an expert by studying and building on the previous generation. Artists listen to other artists. Musicians listen to other musicians. Architects study other architects. Scientists study other scientists. Chess masters study master gameplay. Business leaders review other case stores. Developers share open-source code. Producers review other films. The inability to do this with EHR systems slows innovation and progress. “Currently, we lack any sense of the best design choices for any aspect of clinical systems. There is no manual to consult for the ideal UI for neonatal nurses, or frequency distribution of errors likely to occur with EHR problem lists or a guide for drug interaction algorithms. Just about everything known about complex clinical systems is proprietary, but intellectual property claims are not antagonistic to engineering principles. Aerospace engineering holds no threat to Boeing..."
When you look at clinical systems that had very high user satisfaction ratings, such as Vetran Affair’s VistA, Indiana University’s Regenstrief Institute Medical Gopher System, the Brigham and Women's Hospital’s BICS one of the magic ingredients was the merger under a single roof of healthcare system delivery and health information technology development. Over the last decade healthcare delivery and healthcare technology development have become separated with the wider adoption of commercial off the shelf systems. I believe this makes innovating in both the healthcare delivery side and in the health informatics side to be more difficult. In business, you should not outsource a critical competitive advantage of your operation. In the case of healthcare, that is the very thing that every healthcare organization has done. 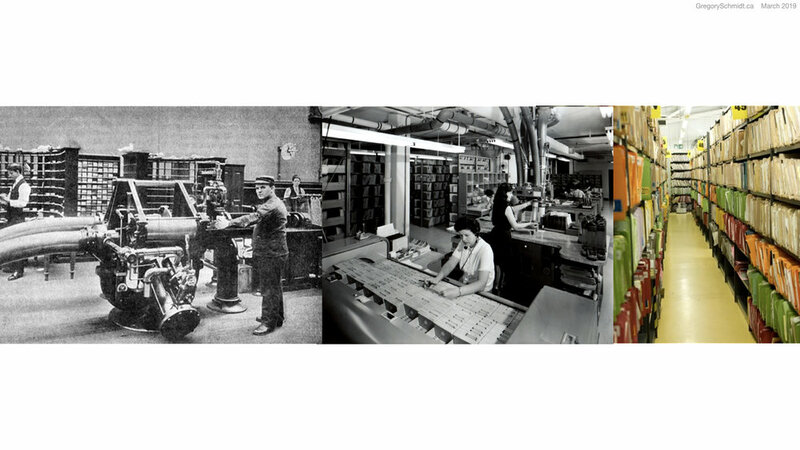 For the first three-quarters of the 20th century, business and enterprise systems were always superior to technologies at home. Consider the original name of IBM - International Business machines. But since the widespread adoption of personal computers and more significantly mobile technologies, consumers have access to more advanced tools often than their workplace. The gap between the technologies users have access to outside of work, versus technologies, they have at work creates a disparity and impression their organization is behind. Design follows product turnover: higher turnover of software results in more innovation in user interface design. The user interface of mobile devices is undergoing radical evolution, as turnover of both the hardware and the software is incredibly quick. This is in comparison to consume desktop hardware and software which had much slower turnover cycles - measured in years. The slowest example of product turnover is enterprise equipment. Who’s product turnover is measured sometimes in decades. The slow turnover of EHR systems (decades), contributes to their lack of innovation. Design follows technology: this theme is a favourite of mine and deserves its own article. But in short, new designs follow new technologies. This applies to any field of design. Take architecture, the reason we have modern buildings with extreme curves and shapes is that we now have manufacturing processes capable of such shapes, and computer software capable of the engineering work required. The same is with interface design and human interaction design. 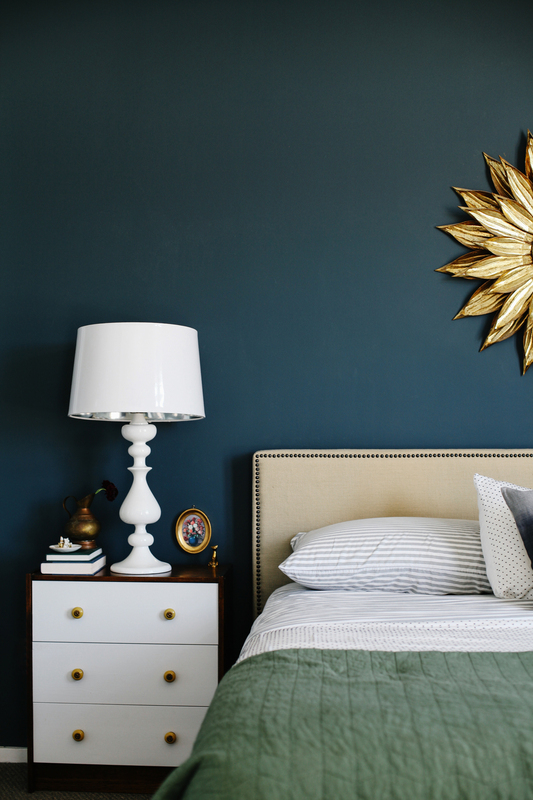 The design we can create is a reflection of the technologies available. Consumer products are quick to adapt new technologies, and as a result their design language updates much quicker than enterprise software that is slow to adapt new technologies. We've looked at the purpose of design, and the failings of contemporary systems. Let's now review five themes and five considerations to help develop better EHR systems. Again, the list is clearly not exhaustive. 1. Improve efficiency: a critical question is how efficient the system is. This means a lot of things. How quickly can new users use the system safely and comprehensively? How quickly can an expert operate the system to input and retrieve data? And then, of course, the larger questions, how does the system effect workflows and care. The Blumberg trading terminal is famously extremely efficient for users who are experts of the system, but highly inefficient for novice users who do not know the shortcuts. What is the net ‘cost' to invest more to train new users vs slow down the entire system with a ‘friendlier UX'? 2. Improve safety: as discussed, reversal of the EHR gag clauses is critical to permitting research, shared learning, and identifying safety issues. EHR system designs can be tested, and best practices disseminated when objective answers are arrived. 3. Improve how clinicians think: an underappreciated impact of EHRs on clinical care is how they affect the way that clinicians think. The order that clinicians consume medical information, the way this information is presented on screen, the role of narrative free text in summarizing a patient's story versus the use of checkboxes - all of this effects a physician's ability to reason, understand a case, and provide empathetic care. This is an understudied area of EHR's. 4. Improve patient care: EHR systems should improve patient care. This means understanding at a deeper level the variation in care, and provide more than just alerts to the user in helping improve care, but assistance in diagnosis, disease management, and team coordination. 5. Improve user satisfaction: how people feel when they use the system is important. If users perceive their workplace uses outdated technology - fax machines, roll-and-scroll DOS systems, lack of ability to email patients, etc - employees will assume their employer does not care about providing high-quality care. In turn, this can influence the way people perform their jobs. 1. Who is using the EHR system? the patient? the doctor? the nurse? Understanding the difference in user needs is critical. 2. What device is the EHR designed to run on? does the EHR accommodate screen sizes from mobile to dual large screen monitors? Does it work offline? How does the clinical decision support function when in offline mode vs when connected to the network? How does the system work with anticipated future interfaces - such as heads up displays? augmented reality? 3. How do people interact with the EHR? mouse? keyboard? voice? medical scribe? digital scribe (artificial intelligence that listens to the clinical conversation and captures the important information)? 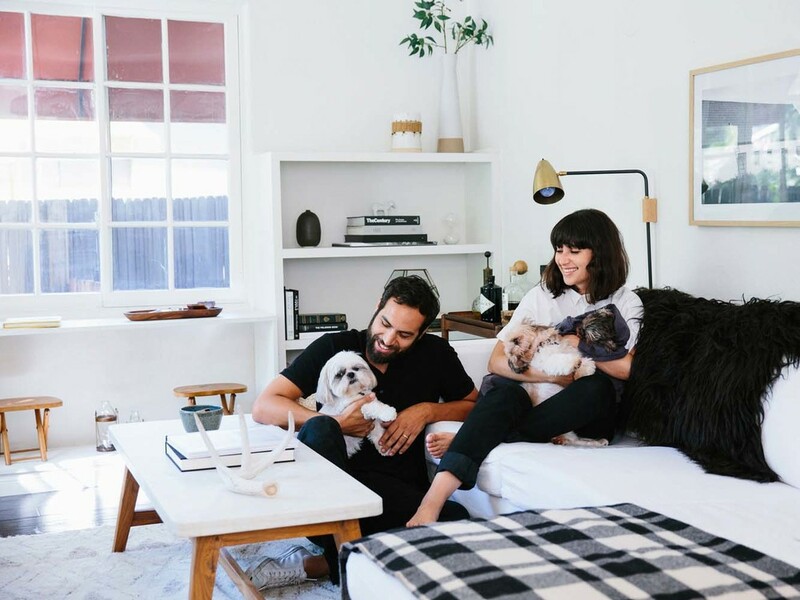 There are numerous methods of interaction to choose from, each has benefits and drawbacks. 4. What is shown on the screen? Are we still replicating the paper chart in digital form? If so, we likely have gone down the wrong route. A recurring theme of Edward Tufte is the importance of data density in helping understand information. EHRs often display data sparsely, resulting in much scrolling and switching windows. This makes integrating information difficult. At the same time, how does the system summarize data, and highlight important actions? As EHRs assimilate more patient data, the ability to summarize data is important. 5. Will this break or build better workflows? An example: an EHR typically has an ‘inbox' where files are received. Lab results may come into the inbox. Then the clinician may have to trend those lab results. But the question remains - why were they ordered? The clinician has to open the patient's chart. Find old clinic notes. Identify what issues the patient has, and why the labs were ordered. Then compare those labs against the medication history (located in another tab). And ultimately decide if they should increase the medications, and change to the order screens. This is in contrast, to when this hematology clinic was on paper. The clinician at the time then would have their clinical nurse receive all lab results. Graph those results on a paper flow sheet that had the patient's name, their hematologic condition, specific lab values that were being trended alongside their surgical and medication history. The physician's workflow, in this case, was to take one look at the new column of results on their flowsheet and in an instant, they knew why the labs were done, how they compare in context. Changes to the medication were made by writing on a sticky note to the clinic nurse. An area I’d like to learn more about is who is leading EHR innovation in the world. This section of the presentation is sparse not because there is not innovation, but because I still have to do more research on this topic. One group in particular that jumps to mind is the MedStart Health National Center for Human Factors in Healthcare. Led by Dr Raj Ratwani he is an outspoken advocate for thoughtful and evidence proven EHR user interface design. Estonia has long been landmarked as a ‘Digital Republic’, and leader in wide EHR adoption. Obviously the size of the country, being just over a million, makes this type of success easier. The December 2017 The New Yorker Article, Estonia, the Digital Republic is a must read [article]. The OpenNotes project has made good progress this last decade changing our understanding of medical records, from a tool that clinicians use, to something that belongs to the patient. Multiple OpenNotes studies have shown the beneficial effects of providing patient’s full access to their medical records. OpenMRS - obviously I’m highly biased, I currently am working closely with OpenMRS, but watch for very exciting news regarding their EHR over the next year. In order to consider the future of EHR design, we need to go back to the start of this presentation: Design is how something works. The question then is - how will healthcare work in the future? We need to consider the challenges and opportunities the future of healthcare proposes. 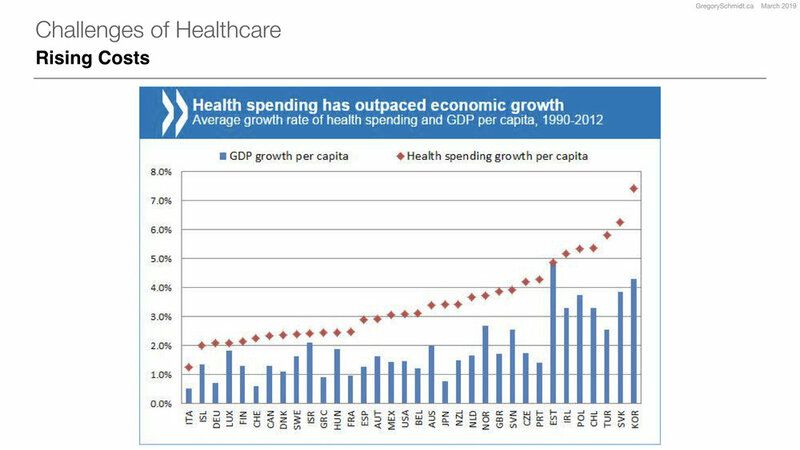 Rising cost: each year healthcare increases at a cost that exceeds the increase in GDP. This is a common problem across almost all countries and is not sustainable. 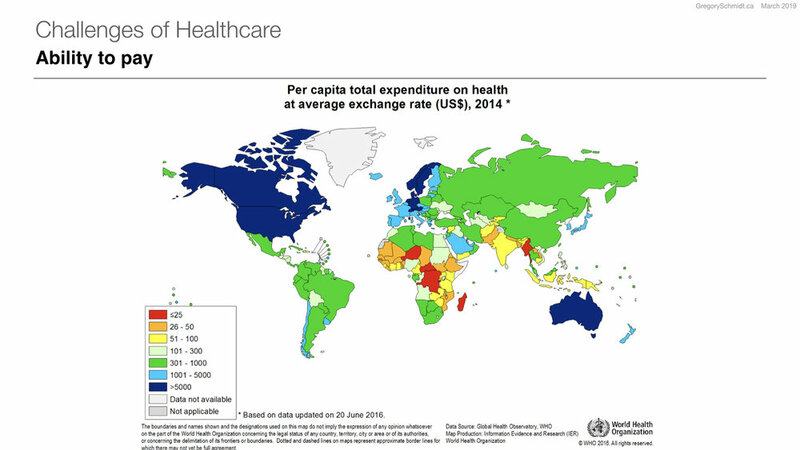 Ability to pay: although many developed nations spend around 11% of GDP on healthcare, many countries in the world spend significantly less per capita. This means the Western model of healthcare will not work financially to be scaled globally. Reduced efficiency: when you look at efficiency by industry, you will note that healthcare is the only industry that really has had a decrease in efficiency, and the corresponding increase in the number of personnel. Variation in quality of care: clinicians understand the variation of quality of care. When the family member of a doctor goes into the hospital questions such as to which hospital did they go? Who was the ER doctor that saw them? Who is on ICU that evening? Which surgeon is planning the operation? We ask these questions because we know that the answer to any of these may have a significant difference in the outcome of care delivered. As long as this is a concern, we have too much variation in care. 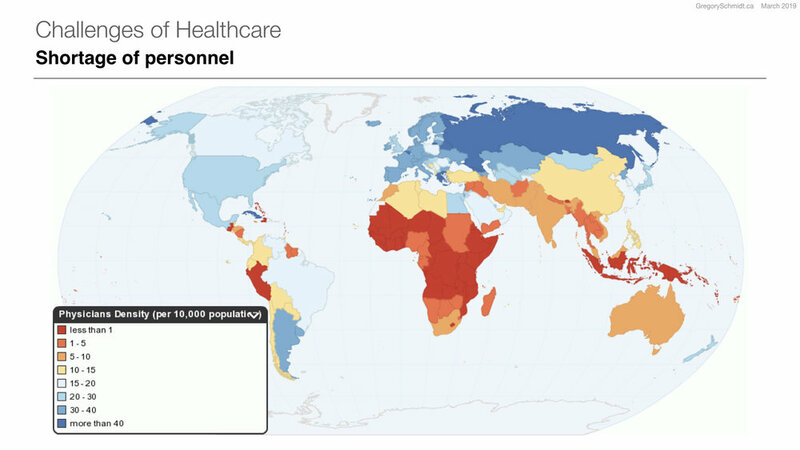 Shortage of Personnel: lots has been written on the global shortage of skilled healthcare workers. And even if we suddenly had the ability to train more, it would take too long to build up the workforce, and if you did, there would not be funding to pay them. The burden of Disease: when you look at the global burden of disease, it is a well-known fact that communicable & infectious disease are common throughout much of the world. However, what many do not realize is the wide rise of non-communicable and chronic disease. This WHO chart shows the burden of diabetes among females and we see the highest burden of disease is in fact not in North America - where we think it is - but everywhere else. The same pattern is seen in this graph showing HTN among males. Change in demographics: all these issues of cost, personal, the burden of disease will be amplified as we look at the change in demographics over the next 50 years in the world. We see that North America's population will remain very flat and decline. Asia has peaked already. And Africa will undergo significant growth. This presents tremendous opportunity and makes early childhood health and nutrition even more critical in being able to optimize the future for these countries. 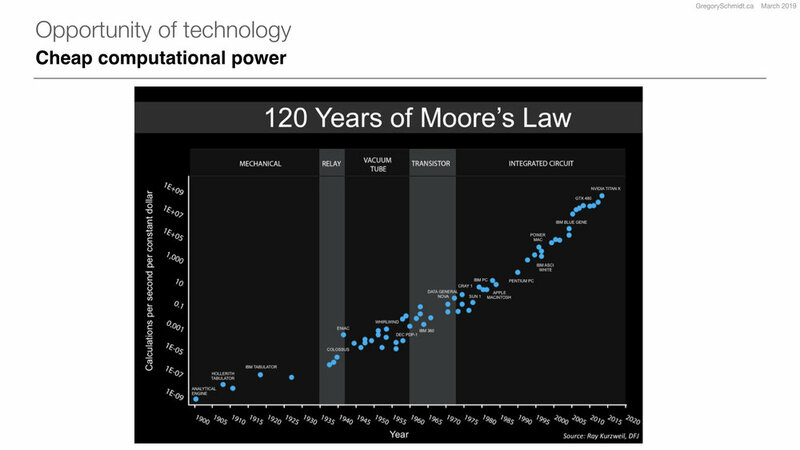 Faster adoption of technology: each decade we see new technologies adopted faster than the year prior. Look at the slope of these lines, and how over time they are becoming more vertical. Widespread cellular connectivity: Mobile phone penetration is widespread and growing on a global level. This graph shows that almost all adults have access to a mobile phone. Cheap computational power: The last century has also been a period of tremendous improvements in the ability to perform computation. Machine learning: The result of this cheap computation, combined with new analysis techniques, is the ability to study large amounts of data - machine learning - and the potential this has to transform healthcare. More Sensors: the decrease in size and cost of sensors means that we will see an explosion over the coming years in new sources of data. This will change how we understand disease surveillance and diagnosis. Genomic Insights: the cost to sequence human genomes has become widely accessible and with it new methods of medical diagnosis and investigation. S-Curve of technology: Last, whenever thinking about a technology, it is important to understand where on its ‘S-Curve’ we may be. Benedict Evans discussed this in detail in his talks. Often when a technology is on the bottom of its curve (the lower horizontal part), it looks flat because adoption is low. But eventually it rapidly becomes adopted (vertical part), and then saturates the market (top horizontal part), as it waits for a new S-Curve from a new technology for us to leap to. 3.1c Is this the time? for EHRs to help rebuild healthcare systems? For much of the last century we have been trying to build better data systems in healthcare. If you review many of the pioneering papers of the EHR era from the 1960s, the goals of what EHR systems can do were very much the same as today: help with medical diagnosis, laboratory analysis, patient monitoring, hospital communication, and service utilization. Early paper from almost half a century ago even demonstrated the benefits of EHR systems - such as Clem Mcdonald’s Protocol-Based Computer Reminders, The Quality of Care and the non-perfectability of man. But for whatever reason - bureaucratic, financial, or technical, the vision of EHR systems has not yet come to fruition. When we consider the challenges faced in global healthcare, the best solution to them is the opportunity of technology. Replicating existing models of healthcare systems is not scalable to the global five billion without adequate care. Nor is the existing models of healthcare optimal to those who spend money on them. Widespread connected computational technology - will allow us to perform dramatic task shifting. The movement of work previously only done by a physician to other care providers. By digitizing healthcare, and building health information technologies that are able to diagnosis and manage routine care, we can create a healthcare model that is infinitely scalable at low cost. Peter Diamandis often speaks of the 6 D’s of exponential technologies - how after a technology is digitized, people first ignore it because it is deceptively quiet. But as an exponential technology grows, it eventually suddenly takes off, in a disruptive rise, and as it is a digital product it can dematerialize and demonetize the industry. As data is the core backbone of being able to build the healthcare systems of tomorrow, the system that stores, manages, and analyzes that data - electronic healthcare record - will play an even more critical role than ever before. The future of the healthcare system really lies in the electronic healthcare record. But the gap between where we are, and where we need to be is huge and presents with its new design questions. How do we design EHR systems that take care of patients? As we shift the coordination of healthcare from an individual clinician, to the digital systems, how do we design systems that coordinate multiple clinicians at once? As machines are better able to augment care decisions, how do EHR systems display their certainty in their recommendations? Like self-driving cars, how do EHRs alert the clinician to take over driving? And how do the clinicians decide how much control to hand over control to the computers? How do patients have a role in choosing what digital algorithms should be involved in their care? How do you design EHRs that facilitate the move from reactive to proactive healthcare? That move from waiting for patients to have a disease, to catching it early in its development? How do EHR systems amplify the work of population health and preventative health efforts to shift the disease curve? How do new sensors that stream data into the EHR display their findings? How do EHR systems allow us to study the variability in care delivery? In order to reduce variability, and correspondingly increase quality and reduce cost? How can EHR systems that educate and train users in clinical medicine as they use them? Many clinicians do not have time nor access to ongoing education. The EHR should train clinicians during their routine use of the systems. How do we design EHRs to work in variable connectivity? In low bandwidth environments? In redundant peer-to-peer mesh networks? How do we display the variable offline states to the user, and how do EHR systems record as part of their record that clinical decisions were made with incomplete information. What types of analytics are able to run when offline vs when connected to a device? How does the EHR facilitate the development of learning health systems? How does the EHR display best practices, medication usage trends, expenses, best to its users in a way that positively influences care decisions? How does the EHR system design facilitate interoperability and maintainability? Is there a migration pathway forward from old systems? 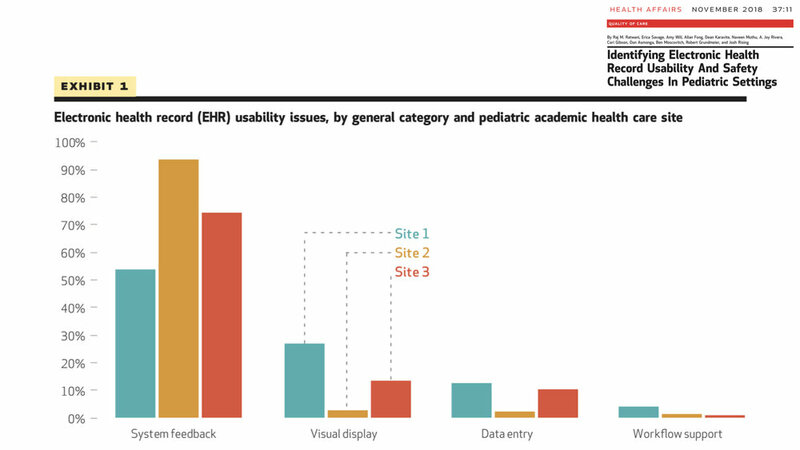 How does EHR design promote data portability? How does EHR design ensure authentication of user identity? How can data best follow a refuge to their new home country? How do EHRs help us identify and advert epidemics and pandemics: Bill Gates has clearly articulated that pandemics are the greatest likely threat to humanity in our lifetime - more than nuclear weapons or climate change. To add to the treatment of traditional infectious disease, new bioengineered threats can be created with garage genomic editing kits for $1500, and the ability to buy viral vectors online. How can EHR design help develop early detection systems? How will EHR design protect individual patient data privacy, and work against data exploitation? How can EHR design allow for real-time clinical trials via randomization of eligible patients and new ways to provide consent? Whether you believe the future state of the EHR is to be at best a smart assistant - a tool similar to a conscientious medical student that helps alert you to information and summarize the patient's history; or if you believe the future of the EHR is to provide significant amounts of routine care through machine aided diagnosis and management, either way, the design requirements for an EHR system are significantly different than the tools we have today. Many new design questions are raised. If you are still reading, I am impressed, this was a very long piece. I hope you agree that the EHR is not a digital filing cabinet, but really needs to be understood as the neural network of healthcare. 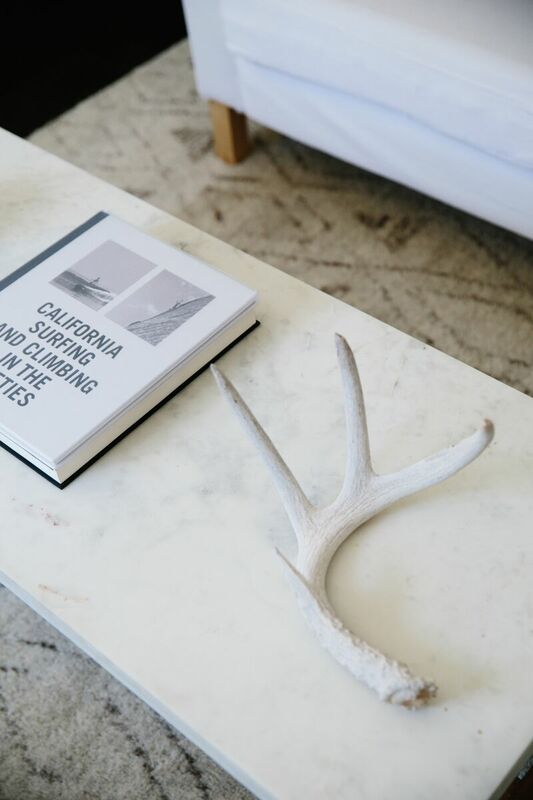 First, we have looked at design - and underscored it is how something works, and the importance of understanding what an item’s purpose is when evaluating its quality. In the case of an EHR, it is a tool that serves the purpose of health care - which is to provide health care. I classified all the other functions it may do, such as billing, reporting, legal documentation, etc as secondary means to achieving the primary function, but not the primary purpose of the systems existence. Second, we looked at design in EHR systems today, and the subjective frustrations clinicians have with these systems, some objective data showing their inefficiency and safety issues, several large very public articles discussing the the state of EHR systems, the causes for their bad design, some suggestions for areas to focus on in better design, and some groups working on EHR innovation. Third, we considered the future of design in EHRs, by starting with looking at the challenges that face us in healthcare from a global perspective, as well as the opportunities new technologies present. Are we living at the right time where the intersection of these challenges and opportunities will help push forward development and innovation in electronic health record systems that are not simply paper charts, but built from the ground up as tools to coordinate the complexity of healthcare delivery and play a significant role in the diagnosis and management of care. Would love to hear your thoughts & criticisms - please contact me.